Looking for answers? Simply curious? 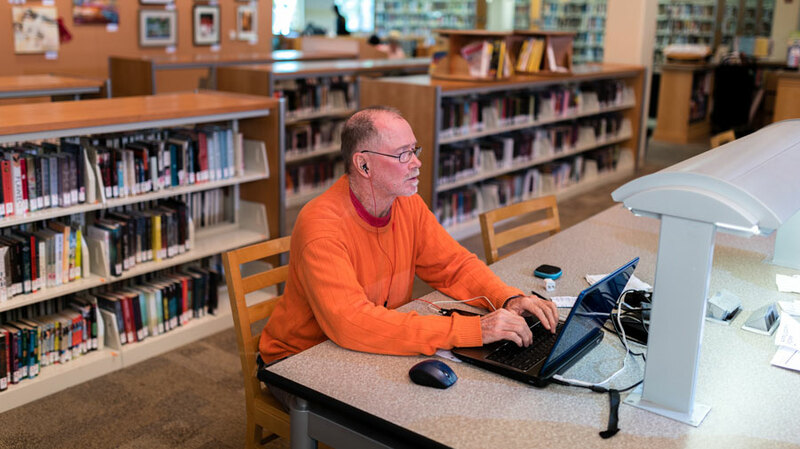 Whether you are gathering facts for a research assignment, exploring new business opportunities, or keeping current with the vibrant Delray Beach community, the Library is your connection to a wide world of information. With free access to excellent research databases and expert staff guidance you are ensured to find the facts. Delray Beach Public Library offers introductory to advanced level computer classes taught in the Technology Center by a Reference Librarians and trained volunteers. The Library offers classes to keep you up to speed in the constantly changing world of computer technology. Computer classes are offered from September to May. All computer classes and training are free to Delray Beach Public Library cardholders. Prior registration is required. Click on the icons below, or see our calendar for class dates. Stop by the reference desk or call 561-266-0196 to register. Registration opens August 1 for September classes, and the first of each subsequent month for the month following. Please give 24-hour notice if you cannot attend a class for which you registered. If you miss two classes without notice of cancellation, you will not be able to register for future classes or the Empowerment Zone. We’ll show you how to use mobile apps to make your life easier — and more fun! Learn about the Library’s digital books, media & magazine subscriptions. OverDrive instructions or try the new Libby app for Overdrive. Stay connected with your loved ones and colleagues! Our experienced Reference Librarians will teach you how to send/receive email, add attachments, and organize your messages. Apple’s iPad and iPad mini are popular tablets that have changed the way we use computers. We offer basic, intermediate, and advanced iPad classes. From graphs to budgets to lists to pivot tables, this program is great for users who are interested in creating spreadsheets and other financial/data documents. We offer basic, intermediate, and advanced Excel classes. Learn how to create professional presentations. We offer basic, intermediate, and advanced PowerPoint classes. Learn the ins-and-outs of this word-processing program, and build your confidence in writing letters, resumes, creating tables, newsletters, working with objects, mail-merge and other features. We offer basic, intermediate, and advanced Word classes. Empower yourself in the EZ! This is a self-learning technology center with volunteers and librarians available for hands-on help. The Empowerment Zone is open from September to May on Mondays and Thursdays from 1:00-4:30 pm to assist customers with filing job applications, creating resumes, live online career assessments, filling applications via e-Government services, online learning, research and database use. The Empowerment Zone is free to Delray Beach Public Library cardholders and prior registration is required. To register, call the Reference Department at (561) 266-0196 or use the online registration form. Empowerment Zone users have access to: JobNow, HelpNow, and LearnNow by Brainfuse; Microsoft Office Tutorials and Practice; Mouse and Typing Tutorials and Practice; Resume and Job Services; eGovernment applications assistance. If you have attended a computer class and have additional questions about class content, you may request a half hour appointment with a reference staff or computer volunteer for clarification. Appointments are based on staff availability and only during the Empowerment Zone operating hours, Mondays and Thursdays from 1:00-4:00 pm from September to May. Visit the Reference Department or call (561) 266-0196 to register for an appointment. The Library offers free access to Brainfuse’s JobNow, America’s premier online career-enhancing resource! You can receive resume writing feedback via email and one-to-one interview help, via chat, from Brainfuse’s JobNow trained job coaches. Delray Beach Library cardholders receive free access to premium resume creation software, hundreds of resume templates, and thousands of industry-specific interview coaching videos as part of the standard JobNow package. Brainfuse JobNow also offers access to Interview Tips, Career Resources, Career Assessments, Job Search, and eParachute to help discover the college majors and careers that match customers’ skills and interests. LIVE Interview Coach service, and resources to help you prepare for your interview. Featuring the Resume Lab and Builder providing the resources needed to craft a winning resume. Have thousands of local jobs at your fingertips through Jobview, a self-service employment application that simplifies the job search process by allowing users to find daily, updated local regional and national jobs from a simple user interface that is purpose built for one task – search and apply for jobs. Must have a valid Delray Beach Public Library card to access. Want to brush up on your interviewing skills or get the best out of your resume? Free Resume Coaching Services are offered on Thursdays from 1 pm to 4 pm, December 13, 2018, to March 28, 2019, with Library Volunteer Merrill Rutman, professional resume writer and job search coach. Thirty-minute private sessions are by appointment only. Free to Delray Beach Public Library cardholders age 18 and older. Registration opens November 1. Call 561.266.0196, email delraybeachpubliclibrary@gmail.com, or stop by the second floor reference desk to schedule an appointment. No walk-ins are accepted. Please bring a copy of your most recent resume or work history to your appointment. Please arrive at the library at least 15 minutes before your appointment to complete an important questionnaire. The questionnaire is available at the second floor reference desk. DBPL’s Brainfuse’s LearnNow provides free access to live academic assistance, practice college entrance exams, SAT, ACT, LSAT, and full academic support in dozens of subjects via online chat! To take advantage of these outstanding resources, please visit the Reference Desk on the 2nd floor and register for a session during the Empowerment Zone in the Tech Center. The Empowerment Zone is open Mondays and Thursdays from 1:00-4:00 pm (September-May). Prior registration and a valid Delray Beach Public Library card are required. Walk-ins may be accommodated depending on registration. The Adult Learning Center has access to live, professional assistance in resume/cover letter writing, U.S. citizenship prep, MS Office Essential Skills Series, and more! There is even a Foreign Language Center/Spanish-Speaking Support. Intended for adults with inquiring minds, the Lifelong Learning Institute offers learning for the time of your life because we believe you should keep on learning no matter what time of life you are in, and that you should have the time of your life doing it! The LLI course offerings include morning, afternoon and evening classes. From a romp through American history and how to write a children’s book to conspiracy theories in art history and music’s power to soothe your mood, we are confident you will find a course that interests you. Click here to read class descriptions and register online or if you’d prefer a printed catalog, you can download it at this link. The Delray Beach Public Library is fully equipped to meet the proctoring needs of Distance Learners, including print and online examinations. Private study rooms are available for print examinations and our Technology Center is equipped to administer online examinations. All facilities are subject to availability. Proctoring is available during the library’s normal operating hours and the assigned proctor’s work schedule. Schedules for examination will be determined on an individual basis, once the proctor agreement has been completed and the test received. Proctoring services are open to the public, with a valid Delray Beach Public Library card. For more information on requirements please call (561) 266-0196 or complete the form here. The Library has several designated rooms for quiet study on the second floor, suitable for individuals or small groups. These rooms may be reserved by phone call or in person at the reference desk. An active Delray Beach Public Library card is required to reserve the quiet study rooms. The quiet study rooms are to be used for studying purposes only and may not be used by individuals or groups for business purposes. For further information, or to schedule a room for study, stop by the reference desk, or call 561-266-0196. Mango Languages prepares learners for realistic conversations and strengthens everyday communication skills in more than 70 languages, including English. Use your Delray Beach Public Library card to log in to Mango Languages. Delray Beach Public Library is serious about business. Think of the Library when you need information about management, marketing, strategic planning, or emerging trends. The Library has business development resources for small business owners, solo practitioners, consultants, corporate staff, and nonprofits. AtoZdatabases is the premier job search, reference and mailing list database. The database has access to 30 million business and executive profiles and 220 million residents. Ideal for sales leads, mailing lists, market research, employment opportunities, finding friends and relatives, and much more! Access a demographic report on any geography–or compare multiple geographies–for information including income, housing, race, age, education, retail spending, consumer expenditures, businesses and more. Use your Delray Beach Library card number for the password. Access to a core collection of licensed online resources and virtual reference works. A collaborative virtual reference service that helps all Florida citizens. Access the digital collections of Florida on Florida and Florida Memory. Floridians have access to more than 50 virtual reference titles. A joint project with the Delray Beach Community Redevelopment Agency (CRA) and the Florida SBDC at Florida Atlantic University Division of Research, the Small Business Development Center satellite office is located on the 2nd floor of the Library. Since 1976 the Florida Small Business Development Center Network has provided consulting to thousands of entrepreneurs in the state of Florida through a network of 40 offices from Pensacola to Key West. The office located in the Delray Beach Public Library serves the needs of Delray’s growing small business community. Whether you are an existing business or considering launching a new endeavor, a few of the many services provided include guidance on market research and expansion, business plan development, financial analysis and feasibility assessment. Consultation is a no-cost service paid for by your local, state and federal tax dollars. To arrange for a private consultation, follow this link and register your interest. Once we receive your request, a member of the team will contact you to set up a meeting. In addition, look for our SBDC Learning Series Programs. Are you looking for a book the library doesn’t own? You may be interested in our Interlibrary Loan Service. The Delray Beach Public Library is a member of OCLC (Online Computer Library Center) which allows us to share our catalog with other libraries. If there is a book the Library doesn’t own, we will borrow it from another public library within the state of Florida. A valid Delray Beach Public Library Card is required. You may check out up to 4 interlibrary loans at time. You may request to interlibrary loan books in print and journal articles in pdf format. Audiovisual materials may not be interlibrary loaned. Requests may take 1-4 weeks for materials to arrive, and lending periods depend on the policies of the lending library. Due dates for Interlibrary Loan materials are set by the lending library. Please request a renewal at least 4-5 days in advance. Please return your interlibrary loan materials to the second floor reference desk. Thinking of a book you don’t see on the Library’s shelves. Inquire if we can order it for you. Suggestions for purchase will be accepted from Delray Beach Public Library cardholders. Suggestions may be made in person, by phone call or online here. Preference will be given to recently published titles, but all suggestions are welcome. Out-of-print or outdated titles will not be purchased. The Materials Selection Committee will consider all suggestions for purchase and its decision is final. Consideration of the purchase of multiple copies for book clubs or other programs will be given.